I watched a decent part of the Bucs game on Sunday. I had fully expected the Saints to wipe the field with them. The Saints defense played well last year and was supposed to be even better this season. And the offense…yeah, they have that Drew Brees guy. Tampa has some good pieces, but playing on the road against the Saints, and with Ryan Fitzpatrick at QB? Forget about it. Saints in a cakewalk. Fitzpatrick lit the Saints up, throwing for 417 yards and 4 TDs. Wow. It hit me at some point that watching that performance was a lot like watching Nick Foles in the Super Bowl. No one thought Foles could get the best of Tom Brady in a shootout, but that’s exactly what happened. The same was true for Fitzpatrick going against Brees. The key for Foles and Fitzpatrick is that the players around them did their jobs so well. Fitzpatrick dropped back to pass more than 30 times and he wasn’t sacked once. His receivers made big plays for him. DeSean Jackson used his explosive speed to get open deep for several big gains. Mike Evans hauled in a 50-yard TD. The Bucs had 8 pass plays of 20 yards or more. They have 5 that went for at least 35 yards. That sounds like the 1999 Rams! This is proof that you don’t need a great QB if all the other pieces perform at a high level. Obviously that’s not sustainable for a long period of time so people go after great QBs. But you can have guys like Fitz and Foles who do amazing things here and there. The Eagles better be prepared on Sunday. Just because Jameis Winston is out doesn’t mean the Bucs will be an easy win. The Eagles are going to have to play their butts off to win this game. One of the real secret weapons for Fitzpatrick is his mobility. If you take away the kneel-downs at the end of the game, Fitz ran 9 times for 38 yards. Some of those were crucial plays when the Saints were desperate for a stop. Fitzpatrick isn’t the most elusive guy, but he’s decisive, runs hard and he’s smart (did you know he went to Harvard?). I guarantee you Fitz will run a few times on Sunday and it will have me pulling my hair out. You don’t mind an athletic QB like Alex Smith or Dak Prescott running for a key gain, but it’s infuriating when someone like Fitzpatrick does it. It will be interesting to see which of the two journeymen veteran QBs will win this game. Foles is keeping the seat warm for Carson Wentz. Fitzpatrick is probably doing the same thing for Winston, but there is more mystery there. If Fitzpatrick beats the Eagles on Sunday, he might just keep his job even when Winston comes off suspension. While Fitz is trying to make his case to keep the job this year, Foles is trying to create a market for himself next offseason. There is a lot on the line for each of the QBs. The Bucs have been a nuisance to the Eagles for a long time. Back in 1979, Tampa beat the Eagles in a playoff game, 24-17. The 0-5 Bucs upset Gang Green, 14-13, in 1991. That loss helped keep the Eagles out of the playoffs. Ray Rhodes first ever game came against Tampa. That was the 1995 season opener. The Eagles lost 21-6 in the “For who, for what?” game. Ugh. Doug Pederson was the QB in Week 2 of 1999 when the Eagles lost 19-5. That game was uglier than it sounds. I was miserable for several days after that. I don’t think I need to cover 2002. Matt Bryant kicked a 62-yd FG to beat the Eagles early on in 2006. And that was with rookie Bruce Gradkowski at QB. Ugh. There was the 2015 debacle where rookie Jameis Winston led the Bucs to a 45-17 win. That really was the beginning of the end for Chip Kelly. Don’t get too depressed. Nick Foles got his first ever win at Tampa in 2012. The 3-9 Eagles broke a 6-game losing streak and celebrated like they won the Super Bowl. It was pathetic and somehow glorious at the same time. 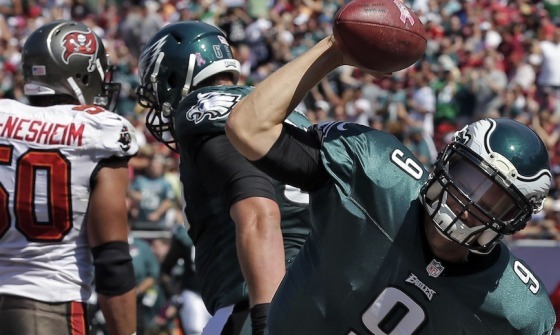 Foles led the Eagles to a win in Tampa in 2013 as well. Both games were at Raymond James Stadium. I guess that makes Nick the landlord down there.